If you live in Orlando, or if you have flown into the Orlando airport, you have probably spotted the "water ski park" off of the Beach Line (SR 528). This week, the kids and I set out to find out what they offer! 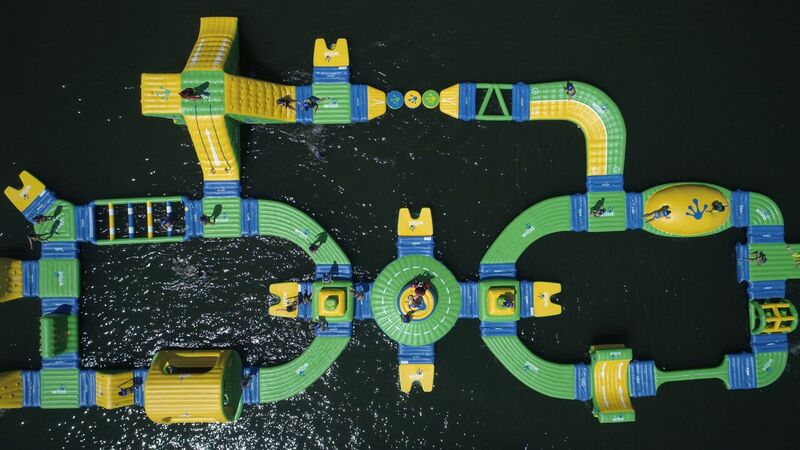 The Orlando Watersports Complex is made up of Standard Cables, Advance Cables, the (NEW!) Aquapark and a Pro Shop. It's the perfect spot to cool off this summer! Our first stop at OWC was the Aquapark. The OWC Aquapark is inspired by LEGO blocks, featuring a modular series of interlocking climbing obstacles, pathways and slides, allowing for endless fun for all ages and skill level. 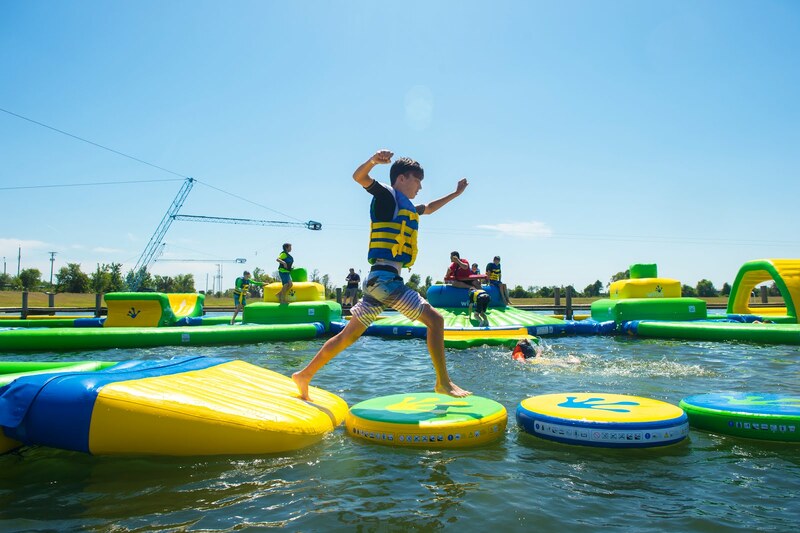 With multiple challenges like the XXL climbing tower, balance beam, monkey bars, rodeo slide and much more! Open daily from 10:00AM – 6:00PM. Reservations are strongly recommended, especially on a weekend. 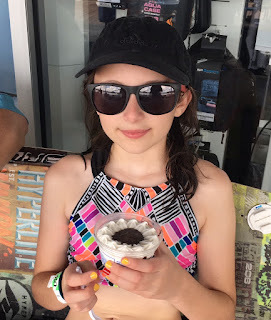 Upon arrival at the Aquapark, we checked in for a wristband and signed a waiver. Water and drinks are available as well as a few (souvenir) tee shirts. Must be able swim – you will get wet!! Adults and kids need to wear a life jacket; many sizes available and included in the price. Safety first! Several lifeguards are on duty. Let's get the fun started -- My two planning their strategy! Can they stay up? It's a challenge! My kids (aged 11 and 12) loved the obstacle course. They made several friends along the way. Next to the Aquapark, outdoor showers are available. After our hour at the Aquapark, we moved over to the main complex to ride the cables! The Standard Cable is a great place to learn the basic, improve your skills, or just hangout for the day. This cable operates slightly slower making it easier for beginners and first timers to learn the fundamentals of watersports. Info on beginner lessons and rates HERE. There is plenty of room to relax -- in the sun or in the shade. 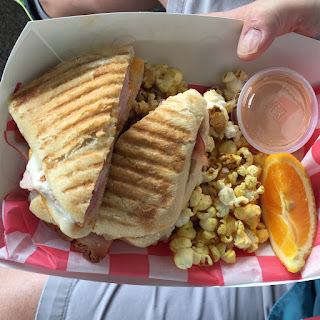 If you get hungry, the Dockside Grill has you covered! A variety of ice cream treats are available. We opted for a hot pretzel with cheese sauce. We are so happy to have find this great spot and can't wait to go back for more outdoor water fun! 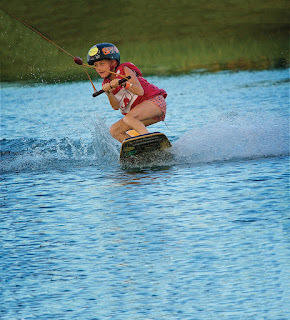 Orlando Watersports Complex (OWC) is located off of State Road 528 at 8615 Florida Rock Rd, Orlando, FL 32824. 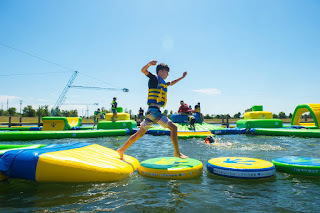 Directions and pricing can be found at http://www.aktionparks.com/orlando-watersports-complex/owc-hours-and-directions/ .